We have mentioned when the test stake pool for Decred (DCR) was released about two weeks ago and now the development team has announced that the staking pool is live on the mainnet. The stake pool allows you to purchase tickets and have the pool redeem and vote on your behalf without having to send actual coins to the pool or having your local wallet online and unlocked 24/7 for the Decred staking. Do note though that in both cases your staking coins used for ticket purchase remain locked. The development team also promises that the source code of the staking pool will be released to the public in a week from now, meaning that we are probably going to see some more alternative Decred staking pools becoming available soon after that. Staking in Decred works in a similar way to a lottery, you purchase tickets with the available DCR coins you have or the amount you want to use. Ticket price started at 2 DCR and it changes based on users staking, though it is currently pretty high priced at about 14 DCR, so you might want to carefully choose the timing when to purchase tickets. Then you need wait for your ticket to be randomly chosen to validate a block or to be taken out of the lottery in 142 days if you do not win anything. The coins you use for staking (purchasing tickets for the lottery) will be locked until they are either chosen and you get your staking reward or 142 days pass . According to the information available the lottery lasts about 28 days average and the chance of a ticket not being selected in 142 days are less than 1%, but since it is all luck based your results may vary. Do note that the staking pool is just making it easy for you to participate in the PoS phase of Decred mining, the staking rewards in the pool remain personal, so every participant is staking just like he would using a local wallet (you still need to have a local wallet to authorize the pool to vote and stake on your behalf). We are yet to see Decred staking pool becoming available where participants will play to win together and the rewards will be shared equally between all participants, so this will probably be the next step in DCR pool staking that we might be seeing further down the road. The Decred (DCR) altcoin that has been generatijng a lot of attention lately is essentially a PoW + PoS crypto coin, however before the block 4096 it is going to be in Proof or Work mode and after that you would be able not only to mine, but also to Stake the coins you own in order to earn more DCR. The Decred block reward is divided in three parts: 60% for a mining, 30% for staking and 10% for the developers with a starting block reward of 31.19582664 DCR coins. This means that the PoW reward for a block is currently about 18.72 DCR, the total PoS rewards is going to be about 9.36 DCR (it could be divided in multiple parts) and the remaining about 3.12 DCR goes to the developers. Furthermore the per-block reward adjusts every 6144 blocks (approximately 21.33 days) by reducing by a factor of 100/101 or with other words ((31.19582664 * 100) / 101) for the first halving. Since in a couple of hours we are going to reach the 4096 block and the PoS phase will also become active you could start staking any mined DCR coins that you have available in your wallet. Decred staking is a bit different than what most other coins use as a method for PoS and the fact that there is still no official GUI wallet and you need to use the command line wallet to activate staking makes it even harder for non advanced users. To enable staking you need to add the extra command line parameter “enablestakemining”, though there are some extra options also available that might help you such as the max price you pay for ticket or the minimum balance to maintain in your wallet. Staking in Decred works in a similar way to a lottery, you purchase tickets with the available DCR coins you have (ticket price starts at 2 DCR), then wait for your ticket to be randomly chosen to validate a block or to be taken out of the lottery in 142 days. The coins you use for staking (purchasing tickets for the lottery) will be locked until they are either chosen and you get a reward or 142 days pass. According to the information the lottery lasts about 28 days average and the chance of a ticket not being selected in 142 days are less than 1%, but we’ll have to wait and see. Do note that in order to be successfully staking you need to have your wallet running and online 24/7 and have the wallet unlocked, otherwise you might miss your chance of winning. The Decred team is also working on a PoS pool where you can delegate your voting rights and participate in the staking without having to run a local wallet all the time in order to stake and you don’t need to send DCR coins anywhere. 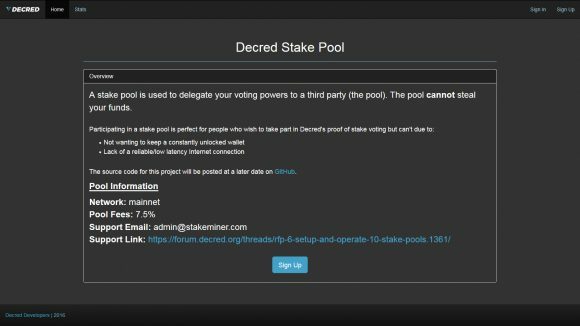 There is already a test Decred Stake Pool running on the testnet, but you’ll have to wait for the staking phase to start and a pool for the mainnet to become available.